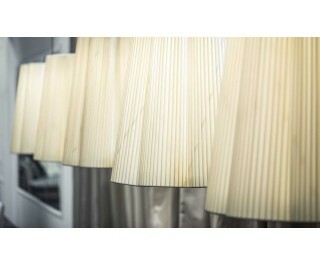 The Fiore is a floor triangle lamp with structure in bright chrome finish or finish with epoxy varnish without solvents. Flower lampshade made with silk satin ribbon. Erba Italia was founded in 2007 thanks to the partnership, which still continues successfully with the designer Giorgio Soressi, our Art Director and creator of our Collections. Our keywords are: search in exclusive materials, clean and elegant lines, tradition of Made in Italy turned to the luxury market. Each piece is born from the essence of en idea and then transformed into substance, living in perfect harmony with the space around. The careful choice of the materials, the attention to details, the exclusive collection of fabrics and leathers, the uniqueness of the lines and shapes, create a continuous link between inspiration and passion. Erba Italia has a large collection of sofas, armchairs, chaises longue and accessories such as rugs, lamps or small table. Lots of ideas for those who want to create a new living space where comfort and beauty go hand in hand.